Together, we can break the cycle of unwanted litters and empower all pet owners to keep their dogs and cats healthy, happy and at home. With your help we can make an amazing impact, breaking the cycle for nearly 11,000 dogs and cats each year with our high quality but affordable spay/neuter surgery. Your financial support enables us to slide our already low surgical fees to a price that is affordable to each pet owner. Your support ensures that no pet owner is turned away because of income. 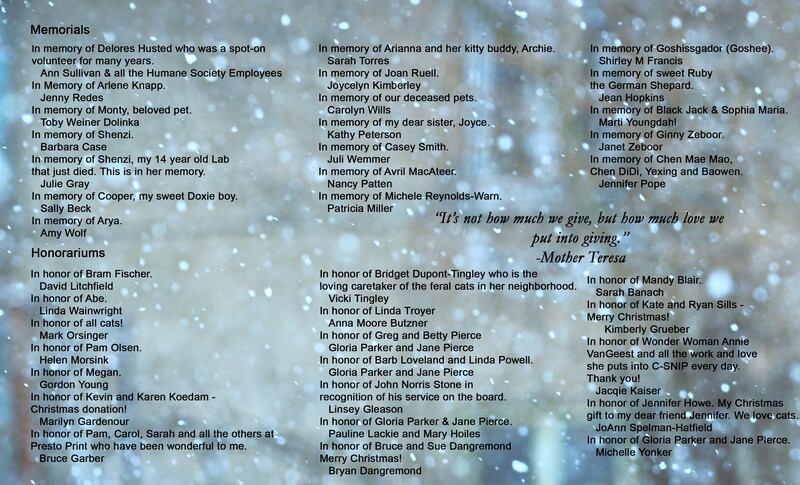 Together we can make a difference for those at-risk pets and their owners. Make your secure online gift today. Support our life-changing mission to help spay/neuter at-risk cats & dogs. Donors are the heart of C-SNIP. Donors who commit to our monthly giving program help ensure our spay/neuter services are sustainable and available for all in need at a price they can afford. Please consider joining our monthly giving program, "Pledgers for Paws". Celebrations are a wonderful reason to honor that special someone with a tribute gift to C-SNIP. 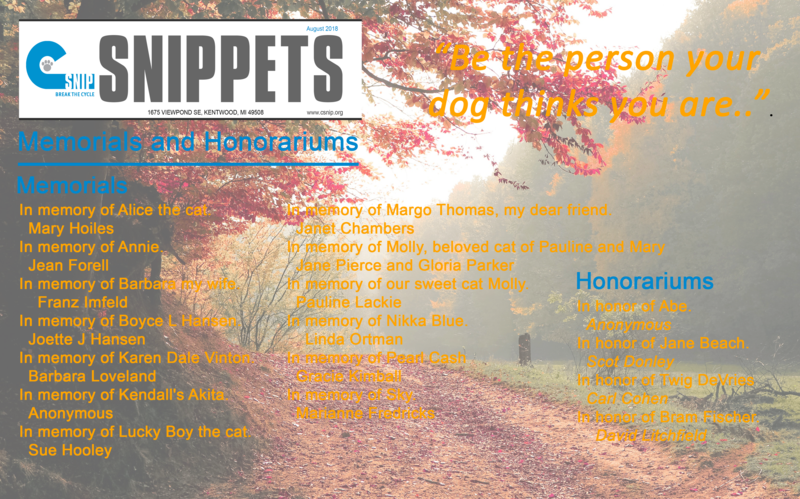 Or honor the memory of a loved one or a beloved pet with a memorial gift to C-SNIP. Let us know of your tribute gift and we will send a note to your honoree or designated person notifying them know of your tribute. The tax receipt will come to you with our thanks. Some employers will match all or part of an employee’s charitable donations. Contact your employer’s HR department to see if they will match your donation to C-SNIP. Consider C-SNIP as you make your estate plans. Your planned gift will help ensure that our services are sustained into the future for those pet owners in need. Check with your financial planner and/or attorney for the estate gift option that works best for you. For more information about a legacy gift to C-SNIP, contact our Executive Director, Sharon, at 616-219-1074. If you’ve already included in C-SNIP in your estate plans, please complete this form and return it to C-SNIP via email or US mail so we can add you to our Legacy Society giving circle. Check out our wishlist of clinic, office and kennel supplies as well as our need for donations of professional services such as printing, graphic design, legal services, photography and other organizational consulting services. View our current Wish List. You and your friends/co-workers can help raise funds for C-SNIP! Do a Facebook fundraiser, consider donating cash from your garage or ebay sales, get your church, co-workers, or community group to plan an event to benefit C-SNIP. Planning a wedding? Consider donating to C-SNIP in lieu of guest favors. You can also support C-SNIP when you shop! Amazon shoppers, do you use Amazon Smiles? Amazon donates 0.5% of the price of your eligible Amazon Smile purchases to C-SNIP when you choose C-SNIP as your Charity. You can also purchase items C-SNIP needs from Amazon and ship it directly to our clinic location. Check out our Amazon Wishlist. Do you shop at D&W; Fresh Markets or Family Fare Supermarkets? Send C-SNIP your Direct Your Dollars receipts to help earn cash for spay/neuter efforts.